Upon reclaiming the Keyblade from his rival, Riku, Sora sacrificed his heart to free Kairi and became a Heartless. Kairi's deep feelings for Sora restored him. Now he must confront Ansem, the seeker of darkness. Riku’s childhood friend, and the hero of light chosen by the Keyblade to stand against the darkness. While Riku was bridled by darkness, he fought Sora, but their friendship proved stronger, and they ultimately worked together to close the door to darkness. A chosen wielder of the Keyblade and Riku and Kairi's best friend. When the Islands fell to Darkness, Sora took the Keyblade from Riku and eventually was chosen by it to become its proper Wielder. The price for this was a bitter rivalry with his best friend since birth, and eventually Sora had to lock Riku on the other side of the door to Darkness in order to hold the Darkness back. On his journey to try and find Riku, Sora fell victim to a plot formed by Organization XIII. They used a girl named Naminé to try and turn Sora into their slave by manipulating his Memories. In order for him to restore his Memories, Sora had to Sleep while Naminé pieced his Memories back together again. He woke several long months afterward in a city called Twilight Town with no recollection of the incident to find the King and Riku still missing and Organization XIII posing a threat to all the worlds. Together with Donald and Goofy and his Keyblade, Sora answered the call and set out to fight the Darkness, all the while looking for Riku and Mickey. On his journey, Sora traveled to worlds he's been to before, new worlds that housed people he met before, and some worlds completely new and unfamiliar to him. Heartless and Nobodies were found aplenty in all worlds, and Sora was intent on protecting as many people as he could. This brought him face to face with many an Organization member who all acted in a hostile manner towards him and tried to manipulate him to help their cause. They called him "Roxas", a name that meant nothing to Sora and was simply shrugged off by him. Matters seemed to be far worse than he dared imagine, however. Regardless of where he went or how hard he looked, Sora couldn't find a single clue about Riku's whereabouts. The only thing he discovered was from Saix, a member of Organization XIII. According to him, something terrible has happened to Riku, but before Sora could inquire further the man disappeared, leaving him in the dark. To make matters worse still, Kairi, who was supposed to be safe and sound on the islands was kidnapped by Organization XIII! The final blow came from a rather unexpected direction. As the Organization was out to create a Kingdom Hearts of their own, they needed Sora to use the Keyblade to slay Heartless. The Hearts released from those Heartless traveled to Kingdom Hearts and empowered it, bringing it ever closer to completion. By continuing to fight, Sora was actually helping the very villains he set out to defeat! There was no choice left for him, however, and if fighting the Heartless helped the Organization, Sora simply had to take the Organization out before they reached their goal. He reached that conclusion after the great fights for Hollow Bastion at the end of which he met a man Sora thought was Riku, even if Sora couldn't see his face. Following the clues he left behind, Sora made his way to Twilight Town and returned to the mansion he first woke up in. There, he found a portal to a parallel Twilight Town which resided closer to the Realm of Darkness and contained another portal leading to the Organization's stronghold. On the way over he ran into Axel, the Organization member who kidnapped Kairi. Not only is she not with him anymore, but he's labeled a traitor and is on the run from the Organization. In a move that cost him his life, Axel protected Sora on his way to the Organization's world and opened the final portal leading Sora there. When asked why he kidnapped Kairi, Axel admitted to wanting to see Roxas once more, and that Sora and Roxas both made him feel like he had a Heart again. Sora got to meet Roxas himself shortly after he ventured into The World that Never Was. Unbeknown to Sora, Roxas was the Nobody he created when he transformed into a Heartless in order to free Kairi's Heart from his Body. The two merged shortly before Sora's awakening and Roxas was dormant up to Axel's death. As a former member of the Organization himself, Roxas was best friends with Axel, and seeing the redhead vanish stirred him back into awareness. Demanding to know why Sora was chosen despite it all, Roxas battled Sora inside Sora's Heart yet Sora proved to be the stronger of the two. Satisfied with Sora's strength and his reasons for fighting, Roxas faded away, declaring Sora to be a "good Other". With the fusion finally complete, Sora gained access to the rest of his dormant potential as a Wielder. He created a path leading to the castle where Kairi was being kept using the Light in her Heart and his Keyblade. He finally managed to meet with the girl, but an even more emotional reunion took place shortly afterward when Sora finally found Riku. 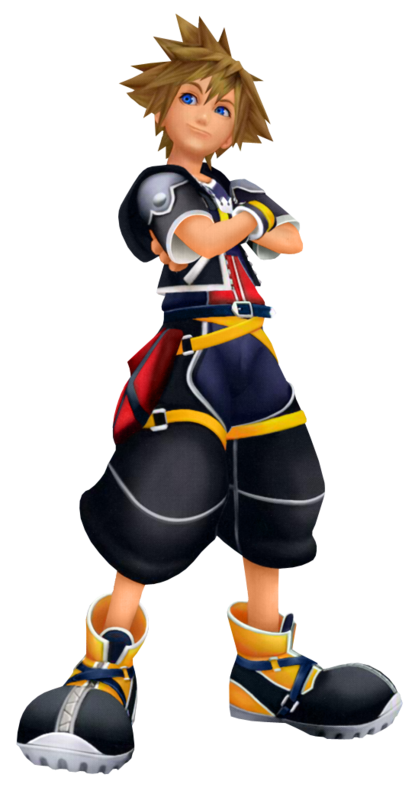 At first the boy didn't recognize his best friend as in order to use the Darkness, Riku took on the form of Xehanort's Heartless. Once Sora closed his eyes and let his Heart see things for him, he couldn't help but break into tears and cling to Riku's hand. "I've looked everywhere for you!" He shouted and refused to let go, regardless of what Riku looked like or what he's been through. Thankfully, that change was undone shortly afterward when an attempt made by the real Ansem to sabotage the Organization's Kingdom Hearts backfired. The man himself disappeared and the explosion purified Xehanort's Heartless from Riku's body, leaving both best friends to stand side by side as their own selves to face the dangers that lurked ahead. Together, the two fought the remaining members of the Organization and won. With matters finally settled, they made peace with each other and realized that despite it all, they were still best friends, then and forever. Following their rekindled Light, the two returned to their tropical home and Sora finally gave Kairi back the good luck charm she gave him, having fulfilled his promise of coming back home with Riku. 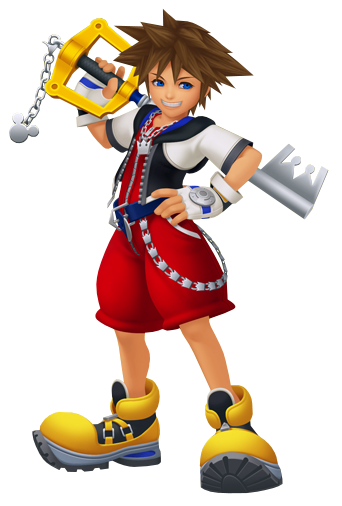 A young boy who wields a Keyblade as a hero of light. He currently sleeps within Castle Oblivion to restore his memories after saving the world from darkness. Darkness, pure darkness. The little ball of light, the newly born heart floated this way and that within the unyielding blanket of shadows, trying to find its way towards its destination. What was its destination? The body of a newly born child on a peaceful world called Destiny Islands. That is where it needs to be; that is where his home lies. The heart couldn't see his home, but it could feel the connection bound within the two, and unconsciously followed it. It had almost reached it when it saw a light, bright and warm, yet flickering, dimming, on the verge of becoming extinguished. It followed it to the heart of another boy, hurt and confused. His name is Ven, and through a series of unfortunate circumstances, the fragments of his heart could just barely hold itself together. Any second now, it would crumble to pieces. The newborn heart couldn't bear to see someone hurt like Ven was, and in that instant, decided to open up his heart and forge another connection, through which the fragmented heart could be sustained. The deed fulfilled, it continued on its way, going where it belonged. With sweat on his brow and sandals that barely managed to stay on his feet, Sora sprints across the sand alongside his best friend Riku, in another one of their little races. It was always a competition between the two, and no matter what the outcome, no matter how futile the attempt, Sora would continue trying and trying until he could one day achieve victory. This time however, it goes without saying that Riku would be champion yet again, scampering across the bridge and onto the paopu tree seconds before he could. After he caught his breath, he noticed his father off in the distance, beside the rowboats at the dock of their play island. Another opportunity within his sight, he quickly challenged Riku to another race and ran off, unaware that this time, Riku had no interest in chasing after him. He darted out of the stairway and across the sand, stopping to look at the stranger by the water's edge, Terra, before continuing on his way. When he turned around, he saw Riku speaking with Terra. He called out to Riku, beckoning him to come over. Once he did, he immediately bombarded him with questions about Terra and their conversation, to which all were replied vaguely as Riku simply danced around the question to avoid answering. Impatient and equally curious, he continued to ask as the two returned home for the day. Shortly after the encounter with Terra, Sora and Riku found themselves in the company of another stranger after racing to the bridge again, the blue haired Keyblade wielding maiden, Aqua. She smiled at them, leaping down suddenly with great accuracy and landing just in front of the children, causing Sora to leap back in shock. For a while, she simply gazed at them, baffling them with her strange actions. Aqua began asking them questions, requesting their names, and about their relationship. The two boys were quite confused, but replied back, eagerly in Sora's case. Aqua then, followed up with more questions, specially for Sora, asking him to take care of Riku should he go down the wrong path. Sora didn't understand one bit, but he agreed, earning a smile and a head pat from Aqua, before heading back home. As Sora and Riku begin heading home after a peaceful night of star gazing on the beach, Sora begins to cry, the exact reason of which unknown. He felt like something was squeezing him inside, and Riku suggested that he open up his heart and listen. Once he did, he found himself, or rather, a representation of himself on a strange platform surrounded by darkness, his heart. A ball of light gently floated down to him, revealing itself to be Ven's heart, who had followed the connection he had established with Sora's heart four years ago. Ven was hurting, and he couldn't return home the way he was at that moment, so Sora offered to let him stay with him. With Ven now content that he wouldn't be alone, Sora opened his eyes and smiled, glad that he was able to help another. Sora sat on the paopu tree holding King Mickey's letter and bottle, looking out at the horizon as he thought about his future. As Riku approached, asking about his decision, he confirmed that he had indeed decided on an action to take. Once Kairi joined the two and expressed her understanding of his situation, he was able to announce that he would leave on another journey, to help all those who were hurting, everyone who had made him what he is today. And thus, another promise is made with Kairi to meet again, with her lucky charm in hand. Various forms of Xehanort followed Sora's journey into the Realm of Sleep and tracked him thanks to a recusant's sigil on his chest. The X allowed the Xehanort's to know every single movement of Sora's, allowing them to manipulate the boy. When Sora lands in The World That Never Was, Xigbar plunges Sora deeper into sleep where he encounted people he had never met before, and was overcome with hurtful emotions. A fateful showdown with Xemnas lead to a massive revelation: Nobodies can grow hearts and the real goal of Organization XIII was to find thirteen new vessels for Master Xehanort to share his heart with. 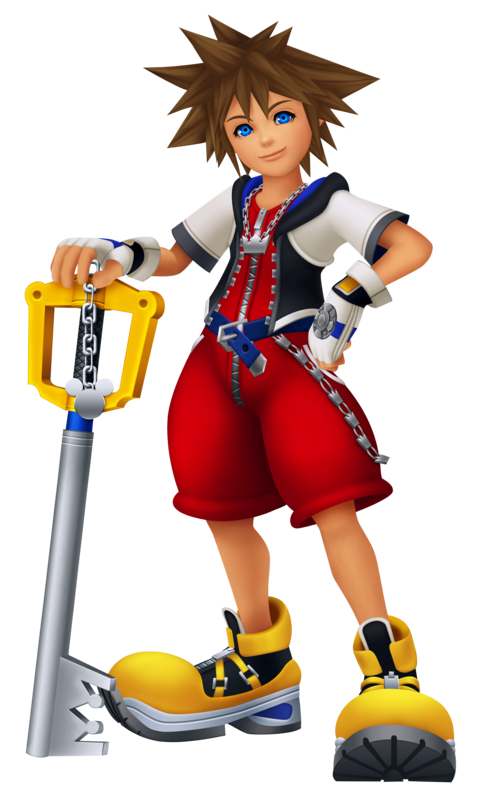 It was Sora who was chosen to be the thirteenth vessel. As Sora's heart went deeper and deeper into sleep, it fell into darkness. A single ray of light chased him down, down, down... Right before the darkness enveloped him completely, an aura of light appeared and clad him in armour. This protected, his body reclined in the Darkness's embrace. Sora was taken to Where Nothing Gather's where he sat in a comatose state. Master Xehanort tries to send his heart into Sora's, but is stopped by Lea. Riku, Mickey, Donald, and Goofy had all arrived to help get Sora away from Xehanort. In the abyss, Rikyu was attakced by a suit of armour clad in deepest darkness. He defeated the armour and freed Sora from its defenses, then watched helplessly as his friend sank into the darkness. Did he do the right thing? Only Sora's Keyblade remained. Riku took it and unlocked the Keyhole. A boy from the Destiny Islands who has the special abiility to connect his heart with everyone he meets. He, alongside his childhood friend Riku, took Yen Sid's Mark of Mastery exam in order to learn how to wake up sleeping hearts. He was targeted by Xehanort, and almost succumbed to his schemes, but was rescued by Riku, Mickey, and other Guardians of Light. After not being named Master, he took some time to see his Dream Eater Spirits in the Realm of Sleep. Upon his return to Yen Sid's tower, he was surprised to learn that only Donald and Goofy remained, as the others had already left to begin their quests. It is here that Yen Sid discusses Sora's latest problem -- Xehanort's attack on Sora has now rendered him weak. Yen Sid tasks Sora, Donald, and Goofy with finding passage to Olympus Coliseum to find his lost strength. With the old highways closed, Sora struggles to find the ability to get to Olympus. It is then that Goofy recounts an ancient Keyblade Master motto: "May your heart be your guiding key." Struck with new found inspiration, Sora summons the Kingdom Key and opens a pathway to Olympus. A boy who has connected his heart to many others. Sora has saved the worlds twice during his journeys, however his recent venture to complete his Mark of Mastery exam left him weak and powerless. In order to be of help in order to stop Master Xehanort from bringing about a second Keyblade War, Sora is instructed by Yen Sid to visit Hercules on Olympus. During Sora's adventures, he meets new friends such as Elsa, Sheriff Woody Pride, and Rapunzel, and meets up with old friends like Jack Sparrow. He is determined to stop the True Organization XIII from succeeding with their plan to create a realm where Light and Darkness exist in equilibrium.